Claude Debussy’s only opera, the tragic Pelléas & Mélisande, is considered one of the most important 20th century operas and a highlight of French music. West Edge Opera has produced an absorbing realization with strong performances and simple but striking visuals in its home for this season, the Craneway Pavillion in Richmond, California. Debussy was taken by Maurice Maeterlinck’s play of the same name. The playwright wrote in the then fashionable symbolist manner, which rejected realism and naturalism in favor of an art that was defined by ideals and spiritualism. Truth could not be gleaned from palpable surfaces but rather through metaphor and dream and imagination. This was consistent with Debussy’s dreamy impressionistic music. Rather than commissioning a librettist to pen a new script to fit the music of the proposed opera, Debussy received the playwright’s permission to use the play verbatim, excising sections to shorten the opera. Maeterlinck would later be awarded the Nobel Prize for Literature with Pelléas & Mélisande recognized as a cornerstone of his contributions. The storyline is rudimentary. Golaud is the grandson of Arkel, King of Allemonde. Upon seeing Mélisande, he falls in love with and marries her. Mélisande meets Golaud’s half-brother Pelléas and they fall in love with each other. Disharmony and deaths ensue. Kendra Broom makes a deserved big career leap in the role of Mélisande. Her warm vocal power fills the space, and she makes for a winsome attraction to the brothers who love her. Significantly, the role is written for a soprano, and Broom is a mezzo. Although no perceptible vocal stress occurs from the unusual voice casting, the result is a darker timbre in the overall sound and less contrast with male vocals. David Blalock as Pelléas, Efraín Solis as Golaud, and the formidable Philip Skinner as their grandfather Arkel fill out the effective lead cast. Jonathan Khuner conducts, and while the orchestra sounded a bit murky at the outset, it finally settled in to a good performance. For those more familiar with Debussy’s pieces containing pronounced melody, such as his beloved “Claire de Lune” and “Prelude to the Afternoon of a Faun,” this orchestral music may seem as lush and beautiful but, in keeping with the story, not as warm. Unlike comic relief that is common in Shakespeare’s tragedies, this libretto is mirthless. The only laugh is unintended, when Mélisande tells Pelléas that she never lies – except to his brother (i.e., her husband). However, the drama possesses considerable edge at times. One of the most distressing scenes is when Golaud hounds his seven-year-old son relentlessly, trying to extract information about contacts that the boy has seen between Pelléas & Mélisande. Perhaps its poignancy is accentuated in these times when the public is becoming more aware of all manner of abuses by the powerful over the vulnerable. 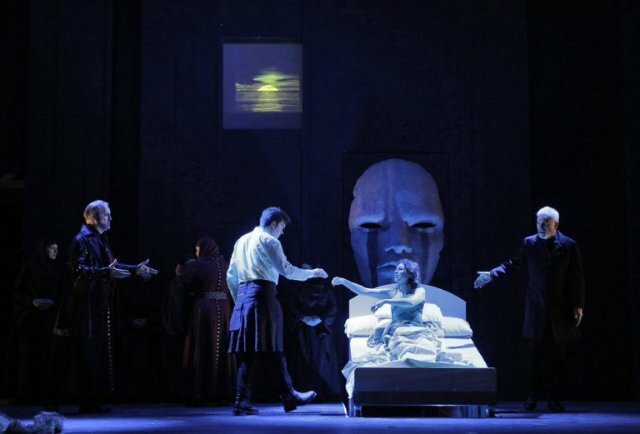 Musically, it is hard to discuss Pelléas & Mélisande without historical context. Debussy was a contemporary of Puccini, who continued the tradition of set pieces with memorable melodies, ensembles with multiple lyric lines, group scenes, and choruses – grand opera. Debussy’s operatic structure flows from Wagner’s principles. Music is continuous with no stop for applause and without the complexities of ensembles. Like Wagner, this opera does use leitmotifs to an extent, but so did Puccini. And like Wagner’s Siegfried, most often there are only two characters on stage at a time, giving it the feel of a chamber opera. That said, Debussy did not like the suggestion that he was influenced Wagner, and indeed he did draw from many others. Director Keturah Stickann oversees stark but stunning staging. The backdrop is black with several movable panels that reveal projections, plus one that opens out into a balcony, and one with a slide to move a bed onto the stage. That all works well except that the panels are balky and squeaky at times. Costumes are mostly very dark and don’t stand out from the background, but with Michael Oesch’s stylish spot lighting, the accent colors in costumes, faces, and Mélisande’s red hair pop to create sharp visions in a darkened world. Pelléas & Mélisande, an opera with music and libretto by Claude Debussy and taken from the eponymous drama by Maurice Maeterlinck is produced by West Edge Opera and plays at Craneway Pavillion, 1414 Harbour Way, Richmond, CA through August 17, 2018.